City of Wolverhampton Regenerating Buildings Preservation Trust (CoWRBPT) are registered charities. They aim to safeguard buildings of historical and/or architectural importance, within the West Midlands and Worcestershire, which are at risk of being lost. As well as projects to protect and rescue historic buildings, the Trusts organise a range of activities to encourage and involve both new and existing members. Read more about membership of the Trusts. Select the links below for details of the Trusts' Projects. 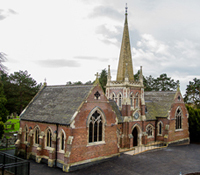 The Thomas Robinson Building (formerly Lye & Wollescote Cemetery Chapels) has won the Victorian Society’s 2018 Birmingham & West Midlands Conservation Award. Full details can be viewed on the Victorian Society's web site. The Lye & Wollescote Project was also rewarded with a 2018 Civic Trust AABC Conservation Commendation. The commendation was awarded as it 'demonstrates the highest standards of historic building conservation and makes a significant contribution to the quality and appearance of the built environment.' Read more on the Civic Trust web site.